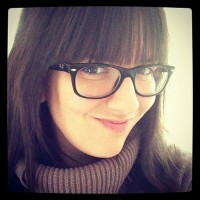 Melissa is on a mission to bring some much-needed love to the people and crafters of Michigan. She’s leading a crafty street team, Great Lakes Etsy, which is a move toward uniting the many Michigan makers who utilize the online store and could benefit from some support and promotion from fellow sellers, and maybe even a hug or two. Proof of that can be found in the “Hug Flint” and “Hug Detroit” postcards. Doesn’t that make you want to “Say Yes! to Michigan?”! 1. Tell us a little bit about Great Lakes Etsy. What motivated you to start organizing Michigan makers? I have always liked the idea of street teams in terms of organizing a cause for promotion. I saw a lot of other street teams on Etsy working together to promote cities and states, and was inspired by them. In terms of Michigan, it was a little difficult because the topic had been discussed, but nothing was really happening. Anyone from Michigan knows this state needs help. There might not be another surge in the auto industry or copper mining, but I feel arts and crafts are something that will remain in demand. Proof of that can be found throughout history, from the early days of makeup by berries or handmade lace. 2. What kind of responses have you gotten from people so far? The responses have been wonderful so far. People seem really interested to help out, even those who were originally reluctant to join. 3. What do you hope to accomplish with the group? Together, we have discussed some of our long and short term goals. In the short term, we would like to generate some money to promote our team. As far as long term goals, the more we promote, the more money we can raise. With this money we are planning on working together to help rebuild and restore Michigan through either one charity or several. Our state needs a big hug. Or perhaps a very big handmade scarf. 4. Do you think Michigan is a good area for the DIY/handmade revolution currently storming the country? I think Michigan is a fabulous place for the handmade revolution. The midwest is known for its hard workers, small towns, and communities. I am from the Upper Peninsula, and my town has seen many local “Ma and Pa” type shops shut down by big corportions. It’s important that Michigan communities know not only their other options, but also that they too can make it for their families and others. 5. What are your thoughts on the Michigan craft scene? I think the Michigan craft scene is definitely picking up, and the word needs to be spread. I feel like the crafters here are sitting on a volcano, and pretty soon it’s going to explode. In a place with very little jobs, people need to know they can make an effort to create their own work. 6. Peanut butter: Crunchy or smooth? Definitely crunchy. And I’m not a “Jif only” snob either. All peanut butter is delicious. 7. How do people get involved with Great Lakes Etsy? There are several ways to get involved with Great Lakes Etsy. Myspace is a good way, or you can email me at: etsymich[@]gmail.com. There is also the official Etsy store. 8. What CD are you listening to right now? Placebo’s new album, Meds. It’s amazing, and everyone should buy it. 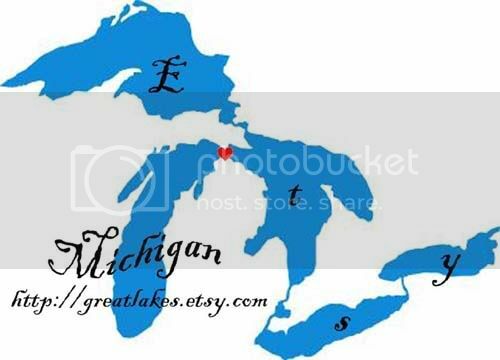 Yeah for Michigan Etsy sellers. Thanks for giving us your support! I know I’m excited to find more Mitten Etsy kids out there! Hi! I’m in the UP and just starting a soap and candle co. should I join Etsy? It’s sooo full of soap and candle. Do people really purchase these types of goods without handling/smelling them ? Anyway, anything to bring jobs back to Michigan.Yes. Glad to have found you.